The best Nintendo SNES Classic Mini deals - including Nintendo SNES Classic Mini with USB Power Adapter now only £79.99! 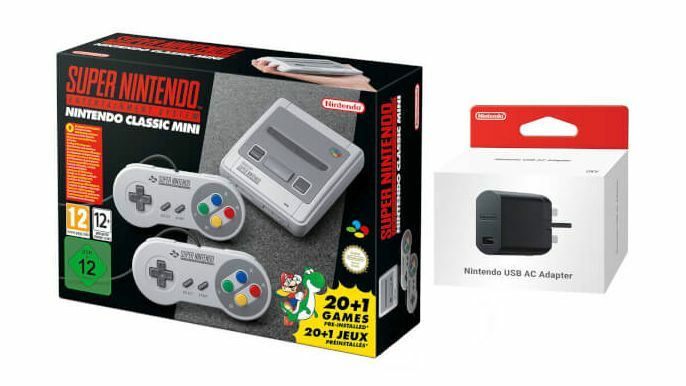 Following the massive success of the NES Classic Mini, launched for last Christmas, Ninty is back with the follow-up generation SNES version in Mini format. That means better games but still an affordable price. Plus this console comes with two controllers for multiplayer fun. T3 has been testing out the new mini console in our NES Classic Mini review, so if you want all the juicy details, including a sweet unboxing video, then head on over. So far the system has been selling like hot cakes, with multiple tranches of pre-orders being snapped up within minutes, however, new pre-orders are being announced daily and we're on hand to recommend the best. The console everyone wants is now back in stock over at Nintendo and, as it is Black Friday, Nintendo has also bundled in its official USB Power Adapter too. The Nintendo SNES Classic Mini has been given a release date of 29 September and a RRP of just £69.99. Sure, this is more than last year’s £50 NES Mini, but the SNES Classic Mini arguably comes with better games and a superior overall package. For the details on said package then read on. An American edition and Japanese edition of the Nintendo SNES Classic Mini are being released also. In the U.S. the console is called the SNES Classic and, while rocking the same games line-up, has a different physical design, replicating the chunkier American-edition of the classic console. The Japanese edition of the Nintendo SNES Classic Mini on the other hand looks the same physically, however boasts the traditional Super Famicom name and a different line-up of pre-loaded games. As more retailers go live with their pre-orders we will link in to them here, so be sure to keep checking back in periodically over the next couple of weeks. In addition, there is a stock checker for the Nintendo SNES Classic Mini you can also keep tabs on too. More information about the Nintendo SNES Classic Mini can be found on the system's official webpage.